Here are 20 fun and educational apple science activities for your students in preschool through second grade. Take half a cup of applesauce and mix with 1tsp. of lime Jell-O. The kids think its great. The items needed for each child is a spoon and a cup. My grandchildren just love it when you make these delicious treats! BUT remember apples are a choking hazard for young children. Core 1 apple. Fill the center with a little butter, brown sugar, raisins and season to taste with cinnamon. Cook for a minute in the microwave, or as I like to call them the “new age ovens”. Allow to cool as hot food is hazardous to older children. This is a great snack for those chilly winter nights in Saskatchewan. Yeah!!! Peel and slice an apple (red works best), sprinkle with strawberry Jell-O or cherry, or try a different kind of Jell-O. Sometimes my children just enjoy dipping the apple slices into the Jell-O. Directions: Cut pie crust w/ biscuit cutter. Slice apple pie filling into smaller chunks. Give children 1 circle, instruct to put a small spoon full of filling in center of the circle. Dab fingers in the water around the edge of the circle. Give 2nd circle and put on top to close the mini pie. Have them walk fingers around the edges to seal the mini pie (can do w/ fork). Bake 350 degrees until golden brown. Serve broken in half w/ a little ice cream. Kids loved it, felt very important, and ran home to tell their Mom’s they could make an apple pie :-)! Apple Triangle Sandwiches. You will need apples for slicing, soft butter for spreading, bread with the crust off, cinnamon for sprinkling, and a sandwich maker that makes triangle shaped sandwiches. Peel and slice the apples with the children. Give each child two slices of bread and have them spread the soft butter on one side of each piece of bread. Let the children count three or four slices of apple to place on the dry side of the buttered bread. Sprinkle with cinnamon. Cover with the remaining slice of bread, butter side up. The teacher places the sandwich into the sandwich maker and cooks until golden brown. When you take the sandwich out the square is cut into two triangles. Be careful, the inside is hot so allow time for cooling! To make it even more simple the butter can be eliminated. Enjoy! This is the best treat in the fall after a trip to the apple orchard or a walk looking at the leaves falling and all the colors. 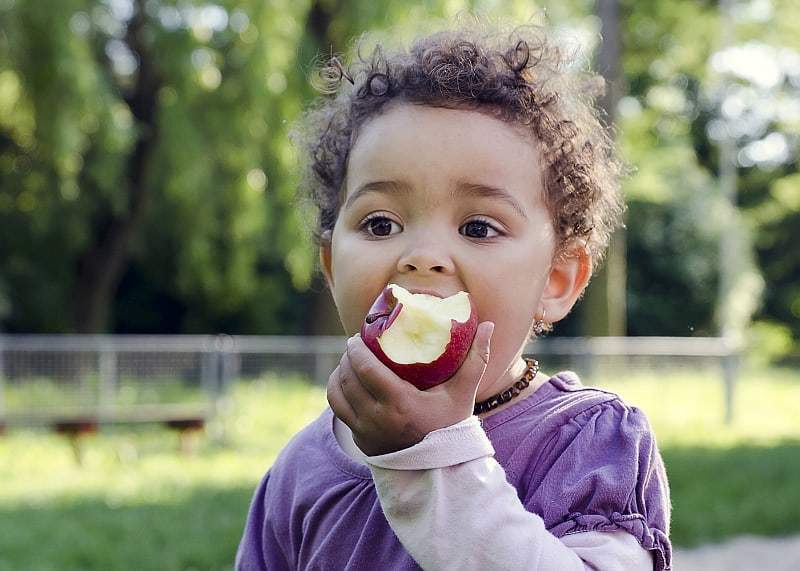 take one apple per child and core them. fill the hole with peanut butter, raisins, small marshmallows, and chocolate chips. This is a walking apple. it is healthy and can be carried around without making a mess. Put a layer of applesauce in the bottom of the cup, then crackers, continue till the cup is full. Children enjoy crushing the crackers themselves as well as layering the applesauce and crackers. This is a snack with eye appeal. Variation; fill cups with applesauce and use the crackers that have been separated as dipping sticks to eat with instead of spoons. Peel apples. Cut each apple into 4 pieces. Remove seeds. Put the apples into a blender with honey and a small amount of water. Blend until smooth. Eat applesauce immediately. When my class studies apples I like to make baked apples. They are a great cooking activity and it’s also a wonderful fine motor activity as well. Depending on the number of students you are working with, you need to core one apple for each student using an apple corer. Then let your kiddos fill the inside of the apple with a mixture of cinnamon and sugar. A medium apple will usually hold 2 tablespoons full. Then they place a pat of butter on the top of the cinnamon and sugar. Next, you wrap the apple up in pre-made pie crusts which you can buy at the grocery store. Make sure that the apple is covered beginning at the bottom and going up. Let the students do this with your help. Make sure they don’t completely cover the hole where the cinnamon and sugar is, just up to the edge of the core. Finally, bake your apples in a 350-degree oven for 30-40 minutes on a foiled cookie sheet. The kids will love these! Be sure you let them cool before serving.